Consider these our starter enchiladas. I've been wanting to make enchiladas for quite some time now but it has never come to fruition. Sometimes, we have no cheese. Sometimes, we have no chicken stock. Sometimes, we have no... well, really, most of the time, I'm just too plain lazy. Tacos and fajitas make the cut more often because they, at least to my mind, are easier to do. 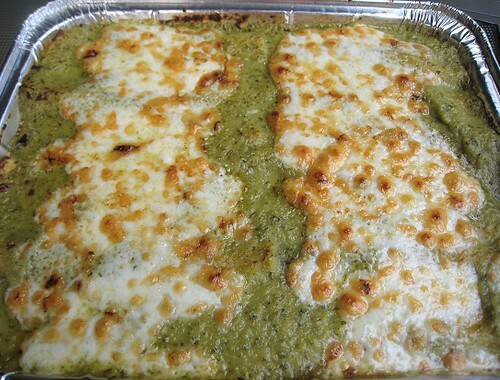 One fine Friday afternoon, we finally had all of the ingredients to make green enchiladas in stock. We used the recipe from Mexico: The Beautiful Cookbook as our guide. 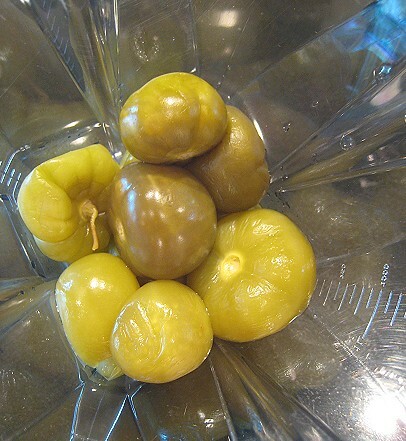 I had stopped by at a Mexican grocery store earlier and bought canned tomatillos, in anticipation of making a salsa verde of sorts. I bought canned because the fresh tomatillos I see on sale look so small and shrivelled, like they've seen better days. I figure I'd take my chances on canned tomatillos this time around. 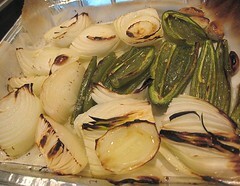 To add more flavour to my green sauce and to boost the tomatillos, I thought hopefully, I did the additional step of roasting the onions, garlic, and the jalapeño and serrano peppers. I simply popped them into a hot oven for about 30 minutes, while I waited for my chicken breasts to poach. 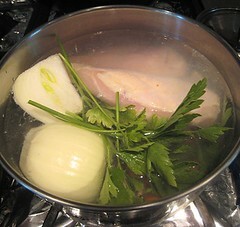 The chicken breasts were poached in a pot of water with onions, parsley, garlic and a carrot. 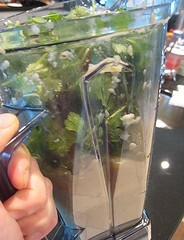 The resulting liquid is reserved and some of it will be used to make the salsa verde a tad runnier. After the onions and the peppers were sufficiently roasted, it was just a matter of puréeing them with the tomatillos, with a bunch of cilantro, in a blender. 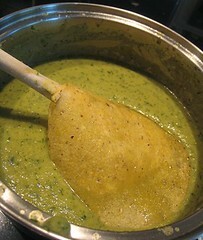 I kept the salsa verde clean and did not add any other herb or spices to it. 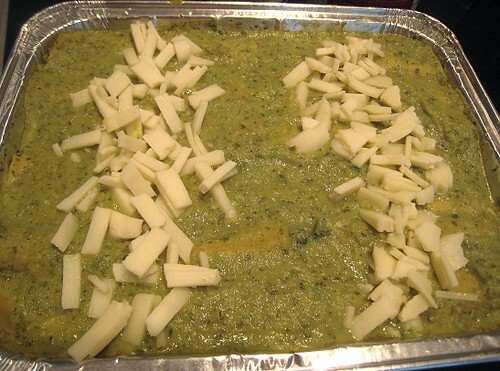 I just wanted a very fresh green flavour for my enchiladas. I suppose the next time we make it I can experiment with different combinations of herbs and spices for a more complex flavour. After puréeing the sauce, they needed to be cooked. 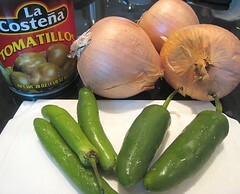 Actually, one needs to add the green sauce to hot oil. Have you heard about that bit about oil and water not mixing? Yeah. 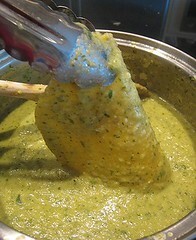 As expected, our salsa verde bubbled and attacked! 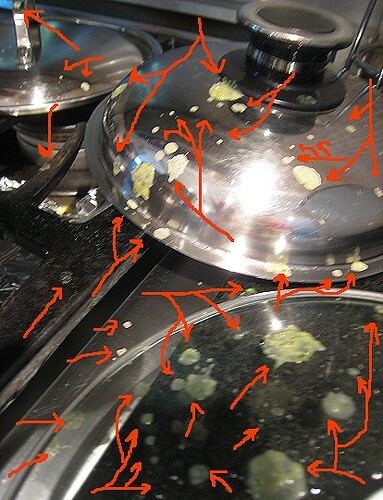 I knew enough to keep the **!#@** back, but our newly-cleaned stovetop was not so lucky. Just one more component needed: the tortillas. They needed to be quickly pan-fried to become pliable. Soaking the corn tortilla in the salsa verde. Assembly of the enchiladas was a two-person job. I figure rolling the enchiladas was not going to be my forte, so TS went ahead and did that part. My job was frying the corn tortillas and handing the pliable tortillas to her to soak in the salsa verde and roll. 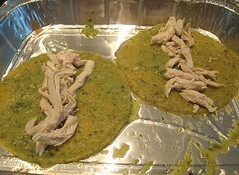 Each pan-fried tortilla was dipped into the salsa verde, filled with the shredded chicken, then rolled. We did 13 rolls. Actually, there were 12 rolls with chicken, and one lone chicken-less roll. 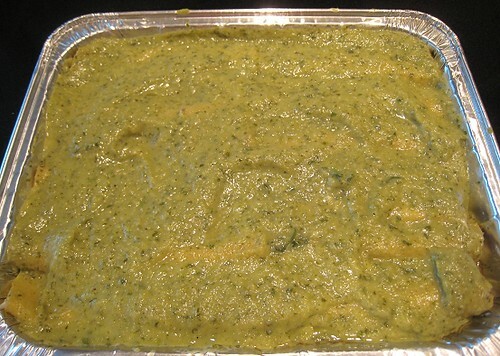 The whole lot was topped with the remaining salsa verde. The only cheese we had in the house was some pre-sliced Monterey Jack. Hey, that works, right? Into the oven, and out. 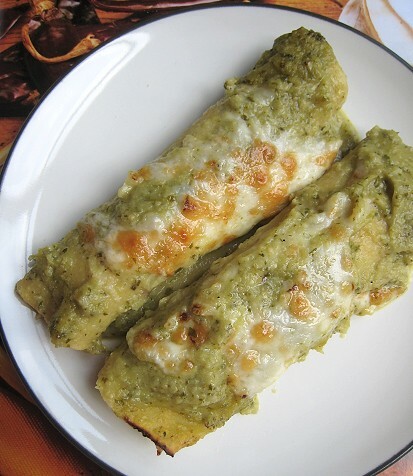 These enchiladas verdes were super-duper good! The recipe says that this makes six servings. They were too good to make it to six. JS, CSC and I finished all of it! 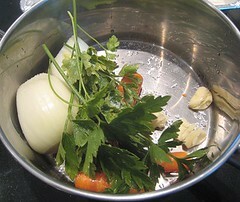 Place the breasts, 4 cloves garlic, 1 onion, parsley, carrot and salt in a pot. Add water to cover. Cover and simmer until the chicken is tender. Remove chicken and shred. Reserve the broth. 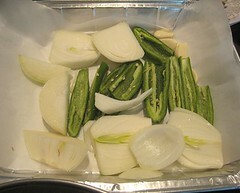 Roast onions, serrano and jalapeño peppers, and garlic in a 400F oven for about 30 minutes. Add the roast vegetables and the tomatillos in blender, adding about 1 cup of reserved chicken stock to ease the puréeing. 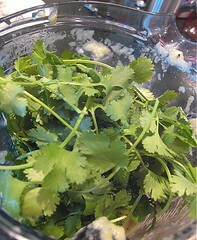 Add cilantro and process briefly. Heat 1 tablespoon oil in a saucepan or stockpot. Add the salsa verde (and stand back!). Cook over low heat, uncovered, for 10 to 15 minutes. Add more chicken broth if too thick. Set aside. In a small fry pan, heat oil. 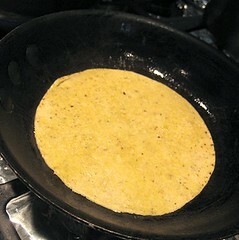 Pan-fry tortilla on each side, about 10 seconds each, until pliable. 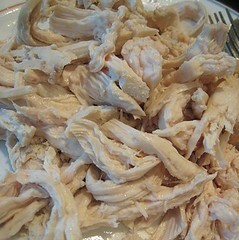 Divide shredded chicken into 12 portions. 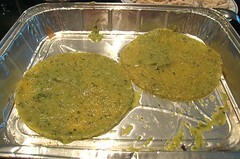 Dip/soak each fried tortilla in salsa verde and place on your platter. Fill with a portion of shredded chicken, then roll. 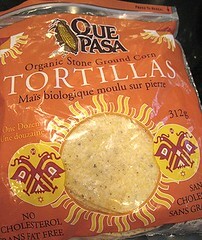 Repeat until you have finished filling and rolling all tortillas. Pour over remaining salsa verde. 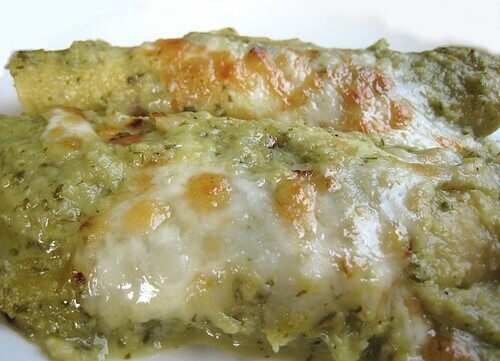 Top your enchiladas with cheese. Place in 400F oven until cheese is golden brown and bubbling. Serve. Tat looks so tasty! 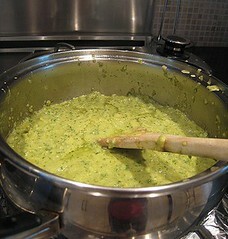 I always enjoy making my own salsa verde. I love that cookbook! I've really learned a lot about regional Mexican cuisine from it. Your enchiladas look fabulous. I... think I can do this! 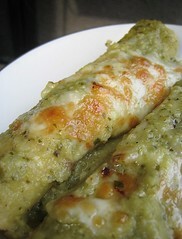 :) I prefer my enchiladas to be (uh, hold on tight for this one) a little sweet! I kinda grew up used to the ones they made in Tia Maria's. However, I recently had one at a new Mexican restaurant-- the sauce was so sweet, it was nearly dessert! Ugh! blogs everyday and cooks consistently exellent. i really love this one. I didn't even know you could get canned tomatillos. I'm trying to grow some, I have one flower..wish me luck. tomatillos should be grown in lots of 2. You should also grow 2 varieties. They are a late harvester as well. Thanks! It's the first time we mnade enchiladas. Won't be the last. Thanks! Yeah, I have other recipes from there that I want to try. Oh, I didn't know about this sweet thing. Try in this way! Hehe... that bubbling and sputtering of the sauce was OUTTA CONTROL! =D Hope you guys try it! Good luck! Our luck has already run out, it seems, in terms of growing things in the garden. 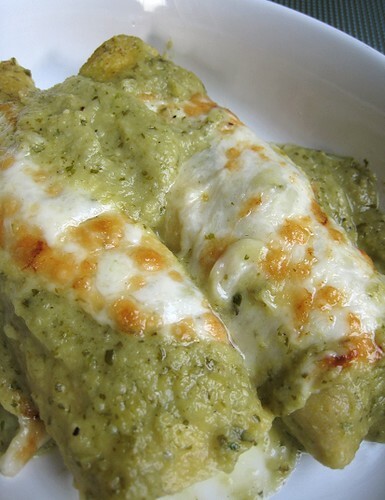 Enchiladas verdes are my favorite, and these look really fantastic! 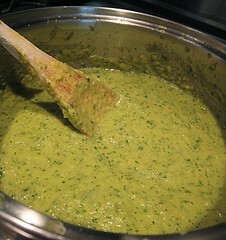 ps, loved the salsa verde attack!!!! Yehey, a vouch for authenticity! =) Haha... it really was a massive attack!